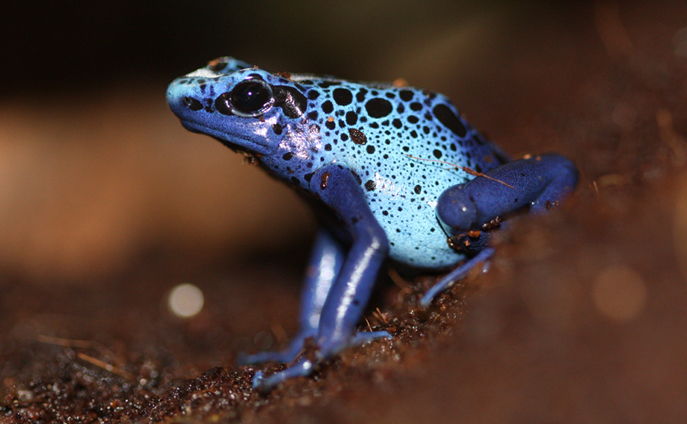 Dendrobates tinctorius is found in small isolated areas in French Guinea and northeastern Brazil. Males of this species place themselves on an exposed rock or tree stump and defend their territory by humming, chirping or trilling. This frog got its common and Latin name from a legend that states that a dye (tincture) of frog skin and blood rubbed onto a plucked green parrot would make the parrot's feathers grow back red. Multiple colour variations of this species exist.